Emotional Bingo, one of my favorite feelings games, is a classic for the play therapist, school counselor, teacher, small group, or even family. It can be played in both English and Spanish. I purchased this durable game in 2001, and it is still in great shape even with regular use. 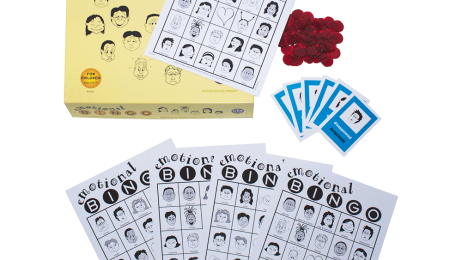 The Bingo and feelings cards could be laminated to make the game last a lifetime. Kids and nervous parents are familiar with Bingo and receptive to trying the feelings version. Learning or reviewing a full feelings vocabulary is essential to improving coping with feelings. So when I play the game with children, teens, or families, I ask that they take turns sharing when they have felt the feeling and/or how they cope with the feeling. For example, if a child draws the feeling sad, the child tells about a time he/she felt sad. Or, a teenager can tell a positive way and a negative way a person can cope with sadness. Parents who play Emotional Bingo with me and their children generally learn details about their children that the parents did not know. I work with parents to help them use active listening to aid in increasing communication at home. Finally, the game can be played with one other person, a family, a small group, or even a classroom. There are plenty of Bingo cards and game pieces for all. Purchase this game and “Bingo!” You will have a great therapeutic game that transcends age and time.